Send messages via Current RMS using Discussions. You can also create a discussion directly from a document layout. To create a new discussion, head to one of the pages mentioned above and click add a new discussion at the bottom-right. Creating a discussion is similar to composing an email. First, enter a subject and then enter some text as a comment. Depending on how your system is set up, you might already have some text in the comment box. 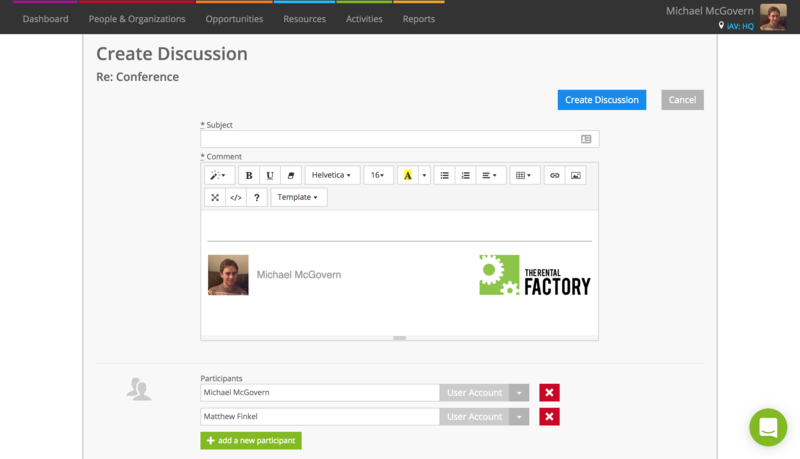 Choose a discussion template by clicking the Template button. Use the toolbar at the top to format your text. A participant is somebody involved in a discussion, i.e. somebody who will get a discussion message. You’re automatically added as a participant; add other people using the green add a new participant button. Choose the type of participant you wish to add on the right and start typing. Current will auto-suggest from your People & Organizations as you type. The first work email address against the contact, organization, venue, or user is used to send discussion messages. You don’t need to add other participants to a discussion. Discussions with just one participant are great for internal notes. To add attachments, hit the green add attachment button and browse for a file on your computer or device. When you’re done, hit the blue Create discussion button. When previewing a document such as a quotation or invoice, just click the blue Create a discussion button. To add to an existing discussion, click the blue arrow to the right and choose an existing opportunity discussion from the list. A PDF copy of the document layout of the document is automatically attached. If your document is set up for approval, be sure to select a template that has the document approval link included.